With parties and events around the corner, these very popular and economical waste containers provide additional recycling and waste collection in a hurry. This is the Disposable Cardboard Trash Can you've been looking for. 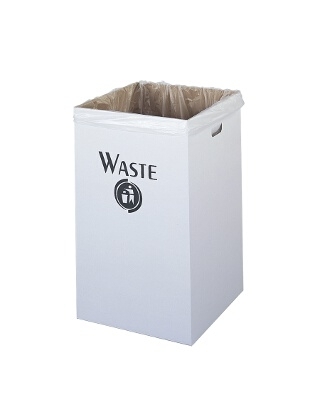 The Safco Corrugated Waste Receptacle Model 9745 are popular time savers. The trash or waste receptacles store flat until needed and are put together quick and easy which also means easy disposal when no longer needed. To use these cardboard trash cans, simply assemble and line with your plastic waste bag (bags not included). White with Black graphics what display the word "Waste" on one side, these come in 40 gallon capacity and packed 12 per carton. One tip is to line the outside with wrapping paper or any paper you want to give a nice matching look to your party or event. Product Dimensions of one Waste Container is; 18-1/4"w x 18-1/4"d x 30-1/4"h.